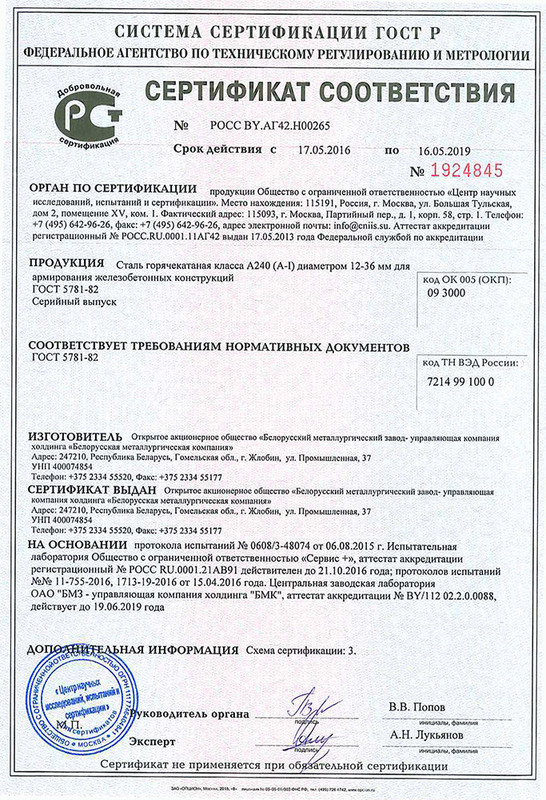 Certificate No.ROSS BY.AG42.Н00265 for production of reinforcing bars grade A240 diameter 12-36 mm according to State Standard GOST 5781-82. 1. Certificate GOST P No. ROSS ВY.АП35.Н04453 for anchor fibre, wave fibre, microfibre,made of steel wire. 3. Certificate No.ROSS BY.AG42.Н00264 for production of reinforcing bars grade A240 diameter 6-22 mm according to State Standard GOST 5781-82. 4. Conformity certificate of GOST R certification system No. ROSS BY.АG35.N04453, for production of carbon and alloy hot-deformed seamless pipes for general purpose in accordance with GOST 8732-78, GOST 8731-74 requirements.